At the Plum Brook Facility a worker paints the quadrant wall. 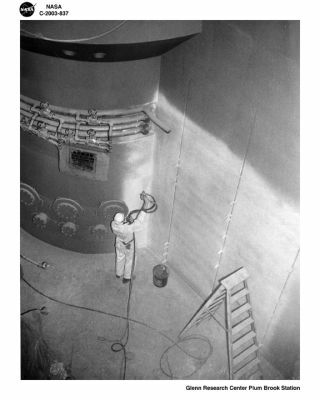 In this historical photo from the U.S. space agency, a worker spray paints one of the quadrant walls and a shielding wall surrounding the reactor pressure tank. The quadrants were twenty-five to twenty-seven feet deep and filled with water. The water provides shielding for the radioactive materials that were transported along the canal basin. For more information browse the Plum Brook Facility Page. Each weekday, SPACE.com looks back at the history of spaceflight through photos (archive). On This Day in Space! April 25, 1990: Hubble Space Telescope Is Deployed on STS-31!